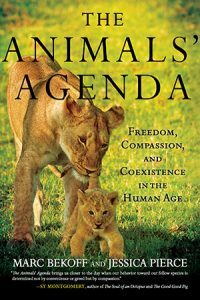 The Animals’ Agenda: Freedom, Compassion, and Coexistence in the Human Age by Marc Bekoff and Jessica Pierce is an important and timely book that examines the human relationship with — or, more accurately, examines the many ways in which humans use — animals and how this relationship needs to evolve. This book asks readers to rethink how we see animals and to adopt more compassionate practices toward them, from animals used for food and entertainment to those in the wild. And this is the main point of The Animals’ Agenda: that non-human animals deserve the freedoms we human animals enjoy. And yet no non-human species comes even close. Even farmed animals who are fed and housed (allowing people to believe they are “cared for”) have no freedom whatsoever: “They are confined to small cages or crates, or else they are packed into a large space with so many others of their kind that physical movement is highly constrained…They have little to no control over social interactions and attachments.” Most of their diets are so unnatural to them that the animals feel hungry all the time, even when they are fed. And lest you think that “free-range” animals have it better, read on; as the authors show, “Humane is a dirty little lie.” Methods of castration, for example, that are “animal welfare approved” by the United States do not require anesthesia. And readers will be shocked to read of the terrible conditions and abuses that occur at AZA-accredited zoos. 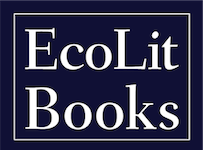 The fact that this book advocates so strongly for animals in other ways makes this chapter on pets a liability, as it risks derailing the book’s entire message: If readers think it’s okay to allow their cats to face injury, disease, and death from traffic or predators, why should they attempt to avoid causing such harm when it comes to farmed animals or captive animals in zoos? 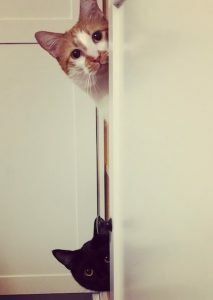 Many animal-rights activists would agree that keeping pets is something that humans should eventually give up — but until every last animal shelter is empty, these animals need to be adopted, loved, and protected. Companion animals deserve freedom the same way dairy cows do, but whereas the life of a dairy cow is a daily torture, most pets are not being tortured simply by being kept inside homes or behind fences for their own safety. Even a free dairy cow would presumably fenced in at a sanctuary, not left out on her own. It’s this chapter, in an otherwise stellar book, that may make it hard for non-activists to embrace the idea of animal freedom. While Bekoff and Pierce detail the good science that is happening regarding animal welfare, they also note that we must “close the knowledge-translation gap”; in the end, much of this knowledge primarily serves the industries that abuse animals. For things to improve, for us to put “what we know about animals into the service of animals themselves,” it will take nothing less than a compassionate society to adopt a mindset of true animal freedom. A very good first step toward that is reading this book.